Why does G‑d tell you how to get divorced, if He believes in marriage? Not only does He believe in marriage, He believes that you should be married, and He wants you to be married to the person you are married to. Why, then, does He allow you to get divorced? Not only allows it, but tells you how to do it? As with all G‑d’s instructions in the Torah, getting divorced is a mitzvah, a divine commandment. In fact, His instructions on divorce are very explicit. But why? Because, having said what His instructions for marriage are, G‑d doesn’t abandon you when you get in trouble. Because He is merciful and compassionate, kind and considerate, He gives you a second set of instructions, in case you can’t follow the first set. G‑d isn’t like that. That’s not how Torah—His set of instructions—is written. He tells you what to do if you ruin the recipe. G‑d talks to us that way because He’s married to us. Like everything else that exists in this world, marriage is a reflection of what exists in the spiritual world. There is an absolute marriage that exists between G‑d and us. Marriage requires that something which you take seriously and strictly upon yourself, you are very lenient and accommodating about with your partner. G‑d is married to us, and that He takes very seriously. He is committed to the relationship. Therefore, He is lenient and accommodating when we don’t always live up to His expectations. G‑d says to us: “You messed up? Then try again. You blew it? Then here is what you have to do. You forgot? Then next time, try to remember. You forgot a second time? Try a third time.” That’s how we know that He’s committed to the marriage. G‑d expects you to be married, and to the person He has chosen for you. But He is compassionate and understanding when you tell Him that it’s just too difficult. G‑d intends for you to stay married. But if you can’t, if it’s too difficult for you, He understands, and He will help you out. Does that mean your marriage was a mistake? You took a gamble, you lost, now admit it and get out? You made a mistake, so G‑d is telling you how to fix it? Your marriage wasn’t a mistake. It was intended since the beginning of time. When G‑d created your soul, six thousand years ago, He created your “intended” along with you. Saying that you married the wrong person is like saying you gave birth to the wrong baby. Could you have somebody else’s baby? A woman once said something like that to me. “You have how many children?” she asked, incredulously. I don’t remember how many we had at that time, maybe ten or twelve. “Don’t you know there are some people who can’t have children?” She was indignant. It was as if she were saying, “Give somebody else a break. Share a little. Don’t have so many kids; let other people have a few.” It doesn’t happen like that. You don’t give birth to someone else’s children. The children that you have were meant to be yours. As Einstein said, “G‑d doesn’t play dice with the universe.” If G‑d doesn’t play dice with atoms or molecules, then He doesn’t play dice with hearts or minds or souls. You are married to the person you are intended to be married to. G‑d arranged it. He set it up; He predestined it from the beginning. In other words, His mind is made up that that’s the way He wants it. Will it spoil “some vast eternal plan,” as Tevye asks in Fiddler on the Roof? The answer is yes. Yes, if you get divorced, you will spoil some vast eternal plan—G‑d’s plan. But will He let you? Will He help you? Yes, He will let you, and He will help you. The reason that G‑d allows divorce, and commands divorce, is because by doing so, He is teaching you how to be married. That’s exactly how you should be married—by treating your spouse the way G‑d treats you. With that much mercy and compassion, that much kindness and consideration. Your wife did it to you again? Forgive her again. She did it ten times? Forgive her ten times. Be as committed to making this relationship last as G‑d has been committed to making His relationship with you last. The moral is, by offering to help you get divorced, G‑d is helping you stay married for all time. The way He has stayed married to you. Rabbi Manis Friedman, a noted Chassidic philosopher, author and lecturer, is dean of Bais Chana Women's Institute of Jewish Studies. A key requirement in the get process is the complete acquiescence of both parties to the proceedings. A divorce is the reverse of what happens at marriage. At marriage, the husband "betroths" the bride by giving her a ring and acquiring her hand in marriage. He is therefore the one who initiates the termination of that relationship. 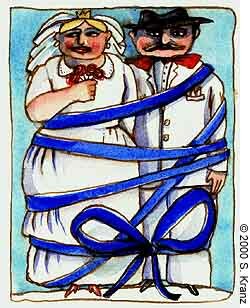 Making a mistake Thank G-d that He helped me with getting a quick divorce. My marriage was a mistake from the beginning and I knew it. G-d tried to warn me and give me red flags but I didn't listen. I went through a lot of suffering. I knew from the start he was not the right person for me but sometimes we're afraid to walk away and instead move forward with a marriage that is doomed to fail. I thank G-d that He gave me the courage to leave, to make 'things happen' that would leave no doubt in my mind. If I would have listened to my instincts, I would have not married my ex husband. What I realised is that we make mistakes and 'deviate' from our course but, Hashem, HaKadosh Baruch Hu, brings us back to where we were supposed to be in the first place. Making A Mistake Sometimes, marriages just plain don't work out. interfaith marriages not real? one of the first posts on this thread claims that interfaith marriages are not real. I have been married to my husband for 10 years and even though my mother is not Jewish and I have not yet converted t, I know that our marriage is real. G-d meant for us to be married just as he meant for our children to be born. Everything happens for a reason, even things the Torah tells us not to do (like what Josephs brothers did to him) . God plans them all so that we can be better. Our children came from our marriage and have brought my lifelong consideration of conversion to the forefront, which in turn has brought out a more observant side of my husband. Our relationship is the very description of what marriage should be. So tell me again how that's not real. Loneliness in a marriage is very difficult. There are no easy quick fixes. I went thru a similar situation. I realized it was not my husband who had to change but me. Begin to bless your husband by giving him the honor and respect that he is due as a protector, provider of your home whether you "feel" like it or not. Lift him up in prayer. As you do your heart will change as will your attitude about this difficult situation. Remember a gentle answer turns away wrath and a wise women builds her house a foolish women tears it down. Above all honor G-D in all you do. You may want to ask yourself if your husband has become your "idol". That is not uncommon for women. If that is the case then repent of that sin and pray for wisdom and strength. This is G_d's standard. We all fall short An excellent wife, who can find? Re: second marriage The Arizal (Rabbi Yitzchak Luria, greatest of the Kabbalists) taught that sometimes a person must first go through another marriage before being privileged to marry his or her true mate.